Pipe Shield is a fast, economical way to ensure free-flowing drains. When used as directed, Pipe Shield prevents materials that build up in your drains and cause back-up. Pipe Shield’s exclusive formula uses natural bacteria to break down organic waste and fatty acids, so it’s safe for the environment. Pipe Shield is sold as an economical concentrate, available in both gallon and quart sizes. Root intrusion may be the single most destructive element facing your home’s sewer system. 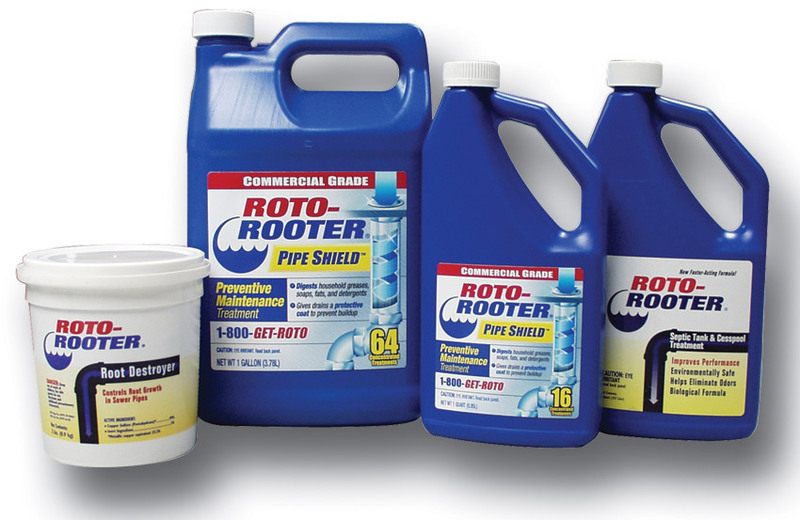 RootX kills tree and shrub roots in sewer lines, storm pipes and septic systems and is available as a service through Roto-Rooter. The patented RootX formula foams on contact with water to reach the top of the pipe where 90% of the roots are. Degreasing agents strip away grime so the RootX herbicide can penetrate roots, killing them on contact. RootX sticks to the pipe walls, preventing re-growth, and annual RootX treatments will help keep your drain system free of root growth. Contact us to ask about our RootX maintenance program.